A picture perfect representation of you might soon be walking, talking, and probably fighting aliens, if Microsoft has its way. In an interview with USA Today, Microsoft Chief Research and Strategy Officer Craig Mundie showed off some new experimental tech fresh out of Microsoft Labs. 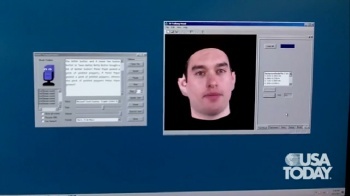 In a video showing a demonstration of the technology, a 3D head read off a script entered into the program, lip-syncing it perfectly as it was read by a text-to-speech program. According to Mundie, it will also be able to watch video of your face and provide similar results. "We can combine 3D modeling and 2D video," he said, "and composite those in real-time, computationally, in order to create an Avatar whose facial animation is very realistic, and the quality is almost like a photograph of a person." But Mundie believes that the tech can be taken much further than just animating heads. If used in an Avatar Kinect style situation, Mundie thinks that the same software could be used to create photorealistic full body Avatars, which would be able to move ans speak in real-time. "We just give you the text as a script, it gets converted into a voice computationally, and based on analysis of the script, it actually animates the Avatar," Mundie said of the software. "There's no reason we couldn't do that in real time by feeding the information that we get from a Kinect sensor, including its audio input and its 3D modeling spacial representation, and couple that to the body and gesture recognition to create a full body Avatar that has photorealistic features and full face animation." So could we eventually see representations of ourselves as the heroes of the games we play, shooting aliens and swinging longswords? "It'll come," he said, "but this is obviously still research work, so it'll be some time before it shows up in products."